Wishing you a merry merry Christmas, and a happy new year! We enjoyed our Christmas at home, dinner with friends, new jammies, stockings, a beautiful musical Sacrament meeting, lots of presents, playing and snacking! Thank you, thank you for all the love sent our way. Our very best to you! he loves anything with wheels. Bria participated in a "Fit Symposium" for JCPenney corporate. The JCP girls design team evaluated the fit of 5 slim and 5 regular pants, and they prompted girls and parents for their feedback. Bria tried on several pair (all of which were ill-fitting, and I told them so! ), made new friends, ate Cool Ranch Doritos (at 9 in the morning) and earned herself a $25 JCP gift card. She was a very cute model with stinky Ranch breath! We had a glorious time with friends decorating both gingerbread cake houses and graham cracker houses! My very talented gf made the cake houses with a darling cottage-shaped bundt pan. (Did I mention they were made-from-scratch gingerbread pound cakes? yummy!) There was tons and tons of candy, frosting, sprinkles, and very creative decor and candy landscaping skills! I agree with Bria, as she emphatically declared, "This is the BEST gingerbread house day EVER!" Many thanks to my wonderful mother who made this tradition for us as kids. You don't fully appreciate all the effort (and clean up!) required to make Christmas magical until you're the grown-up doing all the work! 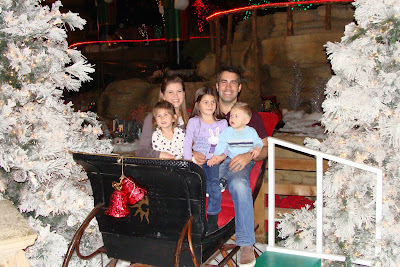 We went to the Gaylord Texan resort with Aunt Amy and Erik to check out the festive lights, life-size gingerbread house, a gingerbread house village and miniature trains. We had a great time! We love Christmas season!